Nehru was born in Allahabad (UP). His father Motilal Nehru was a famous Lawyer and a great Patriot. Nehru was educated in England. As an architect of modern India and a doughty champion of world peace, Jawaharlal Nehru is immortalized in history. Nehru came to be respected as a world statesman for his policies of peace, secularism and non- interference in any country's internal affairs. He was elected as the President of Indian National Congress five times and it was under the President ship of Nehru that Congress adopted the famous resolution of Complete independence at its Lahore session in 1929. When the country gained freedom in 1947, Nehru became its first Prime Minister. Under Nehru India made Technical and Industrial advances. Nehru was a man of letters. His most famous books are his 'Autobiography', 'Glimpses of world History' and 'Discovery of India'. Nehru loved Children a great-deal. Every year his birthday is celebrated as 'Children's day'. 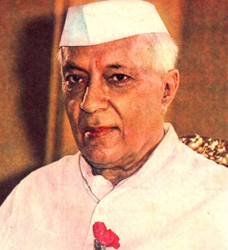 Jawaharlal Nehru was born on 14th November 1889, the first child of Motilal and Swarup Rani Nehru. By 1900, the family had moved to Allahabad and Motilal's flourishing practice saw them residing at a Palatial home, complete with swimming pool and tennis courts. Between 1902-1904, Jawaharlal was tutored by Ferdinand T. Brookes and in 1905, he entered Harrow, one of England's leading schools. Jawaharlal went on to get a degree in natural science from Trinity College, Cambridge and a law degree from the Inner Temple. Whilst in England, Nehru frequently asked for Indian newspapers, particularly "The Times" and much of his correspondence was based on the Indian National Congress. He was happy at his father's entry into the Congress, though he often expressed more severe views than the moderate Motilal. An only child of 11 years, Jawaharlal was a voracious reader and his areas of interest included literature, history, science, philosophy and economics. Already a close friend of Annie Besant, Jawaharlal's holiday to Dublin in 1907 acquainted him with the Lrish Republican Movement. Thus by the time Jawaharlal returned to India in 1912, this young man with a very English upbringing, was already full of nationalist ideas. Jawaharlal, Motilal Nehru and Gandhi shared a unique relationship and their combined importance to the Congress led to them being called the 'Holy Trinity" by some journalists. Indeed the inclusion of the Nehrus into the National Movement had much to do with the relationship between father and son and Jawaharlal's loyalty to Gandhi. "what seemed a tryst with destiny in 1947 was, 28 years earlier, a leap in the dark." The relationship between Gandhi and Jawaharlal was still harder to define, as inspite of many differences they remained loyal to each other. Jawaharlal first met Gandhiji at the 1916 Lucknow Session of the Congress and by 1919 had joined the Satyagraha Sabha. Jawaharlal recognized Gandhi's amazing ability to rouse the masses and Gandhi treated Nehru like a son. The Jallianwala Bagh massacre (1919) had a profound influence on Jawaharlal and his mother's ties with people in Lahore, brought Nehru face to face with official butchery. During the Non Co-operation Movement (1920), the Nehrus became staunch Nationalists. In 1926, Jawaharlal and his family (wife Kamala and daughter Indira) spent a year in Europe, during which time Nehru became associated with Socialism. At the Congress of Oppressed Nationalities in Brussels (1927), Nehru was elected to a 9 member executive committee along with Romain Rolland, Mme Sun Yat Sen and Albert Einstein of the Russian Revolution.
" May God spare you for many a long year to come and make you his chosen instrument for freeing India from the yoke" -- a truly prophetic vision". In 1929 Jawaharlal Nehru was elected President of the All India Congress Committee and was given the reception fit for a king at the Lahore session of 1929. As the Civil Disobedience movement began, Jawaharlal and Motilal spent long periods in jail (beginning in 1921, Jawaharlal was arrested several times - spending approximately 10 years under arrest between 1920 - 1947), but the women of the Nehru family threw themselves into the nationalists movement. Tragedy struck Jawaharlal when his father died in 1921 and his wife, Kamala, died in 1936, both after prolonged illnesses. Jawaharlal remained at the forefront of the National movement and became the Chief Negotiator of the Congress for the Transfer of power. A close friend of Lord Mountbatten, Nehru became the P.M. of the Interim government and on 15th August 1947, became the first Prime Minister of Independent India. Along with Vallabhai Patel as Interior minister, Jawaharlal Nehru ensured the accession of the Princely states to India and extended a hand of friendship to other Afro - Asian Countries. The architect of India's foreign policy, Nehru defined it as anti-imperialist, anti-arpatheid and anti-colonial. Nehru also believed that the newly independent states in Asia and Africa had the right not to join either the Soviet or Capitalist Power Blocs. Thus he along with Tito (Yugoslavia) and Nasser (Egypt) founded the Non-Aligned Movement. Nehru did not consider the "Non Aligned Policy" to be neutral but he believed it allowed Nations to accept aid and maintain good relations with Nations from both Power Blocs. The only blot on Nehru's foreign policy was the breakdown of the "Panchasheel" agreement signed with China -- In 1962, the Chinese Aggression on India was a huge blow to Nehru. But Nehru's numerous trips abroad, India's membership in the commonwealth and commitment to anti-apartheidism and anti-colonialism were well received. In December 1929, Nehru had declared that "our economic programme must be based on a human outlook, and must not sacrifice men to money". In keeping with this, Nehru's economic policy was socialist in leaning, giving India a mixed economy and five year planning. Unlike Gandhi who believed that village development was more important, Nehru concentrated on industrialization, refeuing to dams and power units as India's new Temples. Nehru died in 1964, plunging India into mourning. By no means a perfect leader, Nehru was an introspective, sometimes impetuous man. Passionately fond of children, his birthday is celebrated as children's Day in India. "the Rituraj representing the season of youth and triumphant joy of an invincible spirit of fight and uncompromising loyalty to the cause of freedom." Nehru tutored by Ferdinairn Brooks. Jawaharlal Nehru meets M.K.Gandhi for the first time. Jawaharlal Nehru elected to 9 member executive committee of Congress of oppresed Nationalities in Brussels; attended 10th anniversary celebration of Russian Revolution. Elected President of All India Congress Committee, Leads Lahore Session.